Western blot analysis of extracts from HeLa cells transfected with 100 nM control siRNA #6201 (lane 1), MEK1 siRNA (lane 2), MEK2 siRNA (lane 3) or MEK1 and MEK2 siRNA (Lane 4), using MEK2 Antibody #9125 (upper) or MEK1 Antibody #9124 (lower) in combination with GCK Antibody #3782. 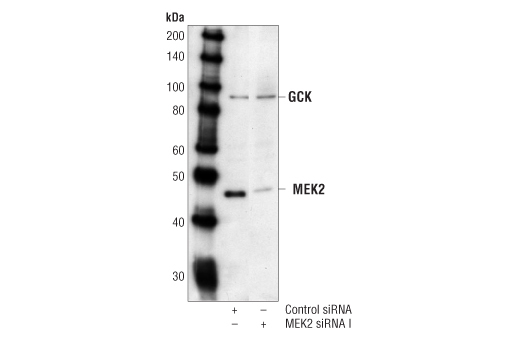 The MEK2 Antibody confirms silencing of MEK2 expression, MEK1 Antibody demonstrates MEK2 siRNA has no effect on its homologue MEK1, and GCK Antibody is used to control for loading and specificity of MEK2 siRNA. 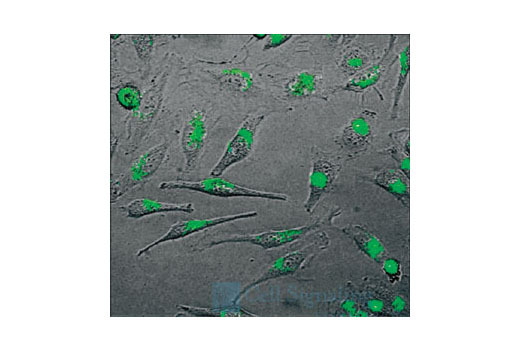 CST recommends transfection with 100nM MEK2 siRNA 48 to 72 hours prior to cell lysis. See Protocol for transfection procedure. Small interfering RNA (siRNA) has been used to specifically silence MEK2 expression in HEK293T cells (5).